could imagine, what level is your pain now? A question I was asked hundreds of times. The question I asked instead was: what does it mean, to heal? The timing had to be right, the traffic manageable. Twice a week, I would be rushed by a friend out the door of the Intensive Care Unit at the UC Davis Pain Center in Sacramento to the nearest redwood forest, Muir Woods. It was a two-and-a-half hour drive. When I arrived at the state park, an hour or so before closing, the lidocaine would be about to wear off. A short span of time remained for me to be fully in the world. I had come in hope of a synergistic effect, the possibility that a forest infusion might magnify the benefits of the lidocaine infusion. Now I walked upright, effortlessly. Soon, my head would feel heavy, like the cast iron ball of a convict’s ball and chain, dragging me downward, so heavy that I would be unable to stand or sit upright. Now shapes and colors, the green of a moss-covered tree stump or yellow of a banana slug crossing my path, were vivid; the scalloped curves of each leaf of clover, the segmented geometry of each cobweb, immediately apparent. Soon, all objects in my field of vision would recede into a blur, discernable only with the strain of repeated staring. Yet the moment at hand was a reprieve, an afternoon not to be squandered, time for looking up. While still in a state of quasi-wellness, I would lie down in my winter coat, in the center of a family circle of redwood trees. There I would drape my backbone over the forest floor layered with hard protruding tree roots, soft mosses and fungi, scattered needles and pine cones. The stream tumbling over stones and branches cascades through the open doors of my senses. Filtered shadows lighten briefly, then darken with the recurrent breeze. San Franciscans complain of overcast days but only the fog, the ocean’s nearness, sustains the coast redwoods. The smell of dampness, of cedar and bay laurel trees, calming and refreshing my senses, was what I missed most living in Montreal, thousands of miles away. Only the deep scent of this forest can expunge flashbacks, odors of patient gowns and hospital corridors, cocoon me from the assaults of memory. I inhale and am buoyed elsewhere. The view above beckons my attention, spokes of a tree circling upward along the trunk as if toward an infinity of light. Each branch is tipped with a shock of newly grown needles, like pale green nails on dark fingers, outstretched, reaching. On the day of my first appointment in the ICU, the doctor explained by way of a metaphor the lidocaine infusion he would be administering. It would be a kind of reboot. If my nervous system were the operating system of a computer, it would be like having the control-alt-delete keys pressed simultaneously. The lidocaine slowly trickling into my blood stream from a plastic bag attached to a needle in my forearm would provoke the closing of sodium channels and thereby prevent sodium from reaching any of the cells of my body. Nerve cells, therefore, would pause their incessant firing. (Hence the need for the procedure to be done in an ICU: theoretically, the infusion could stop my heart.) With the nerves quiet, muscles and fascia would no longer tighten and spasm. All pain would cease temporarily. It seemed quite theoretical as the doctor in scrubs explained it, but that very scenario occurred seemingly more or less according to plan. Initially, I was jubilant. After a test run, the second infusion left me functioning nearly normally and pain-free for three days. Unfortunately, the curative effects of the third infusion lasted only two hours, those of subsequent ones, three or four. To heal: why I am here, lying on my back in this forest of coast redwoods. Sequoia sempervirens, named for the great Cherokee leader, wordsmith and visionary, and for the coast redwoods’ perpetual greenness. The second word in the name means also “always alive”; here in the park, new potential tree trunks grow skyward from the side of a bay laurel toppled in a storm as I have seen redwoods do in other places. Redwoods have a history of being scorched by fire, some charred to the root by a lightning strike. We speak of harsh events, violence, as seared into memory. Thought of the fleshy root of my tooth burned in the dentist’s chair triggers a somatic flashback. I am again six, trying to pull from my jaw a tooth hanging by a single thread of tissue, the ligament attaching tooth to gum. A first grader, I want the small gift that I know the Tooth Fairy will slip with deft maternal fingers under my pillow. Thinking of the crinkly package, I keep turning my loose tooth in its socket. My grandfather, partly paralyzed from a stroke, watches me twisting the tooth and grows agitated. He doesn’t want me to lose my teeth and wear dentures like him. I try to explain that another tooth will grow in place of this loose one. A new tooth magically regrowing out of my bare gum? Zayda doesn’t believe it possible. His eyes fill with tears. Many years later, my witnesses are Californian redwoods, beings who have known fire through the ages and returned each time stronger than before, the coast redwoods persisting for hundreds and giant sequoias for thousands of years. To heal is not to reverse time, reclaim for one’s selfish benefit a private fountain of youth. No growth is without damage, deficit, blood. The glossy perfection of new life, pristine enamel of a six-year-old’s bicuspid or lime-green softness of a redwood branch-tip, comes at a cost. At the empty center of the circle where I’m lying now was once rooted a primeval redwood. Fire torched its trunk, branches and bark to cinders dispersed with the wind. Imperceptibly, what was left of it inside the earth later regrew into a full circle of genetically identical trees, two hemispheres around the hearthstone of the originary redwood. It sounds like mythology but it is true. The coast redwood actually is the Phoenix of the forest. This intriguing species once offered a way to explain death in a hopeful light, the family circle illustrating the circle of life in a 3-D diorama. Today, in the wake of global warming, redwoods lack moisture; their most lofty upper reaches shrug brown needles from branches brittle and dessicated. Park rangers no longer speak of fire season. Year-round wildfire is now the status quo turning all to combustible twigs; fog and damp recede before the steady incursion of drought and flame. Redwoods that used to grow two to three feet a year now progress by bare inches. In the unrequited thirst of these last remaining ancient trees, for whom humidity is breath, millennia of fire and rebirth have come to a dead end, the family circle broken. If there were ever a fire, my brother told me that I should go to his room. There was a tree outside his window, the escape route. If I smelled fire or heard him call to me, I should go to his room and he would carry me down the tree, away from the flames. He brought me to the window to show me the slope of the tree branch we’d climb down in order to reach the ground. We’d be safe together. He knew about fire and how to stay safe. Just thirteen himself, he was looking after his sister, imparting valuable knowledge of danger and survival. What fires together wires together: basic neuroscience, Hebb’s dictum. What fires together also roots, embeds. Like a Chinook salmon, a monarch butterfly, I contain memory of my point of origin on earth, some fierce internal yearning powerful enough to pilot us home. I have no other explanation for what brought me from Eastern Canada here to a redwood forest in California, the place where I remember being last most fully alive, agile, part of a family circle: whole. I am six, walking alongside my brother on a hot summer day in a redwood forest. I can feel my hair toasting in the sun when I wipe the sweat away. My brother takes off his red cowboy bandana, kneels next to me as he folds the scarf in two, aligning the tips so it forms a triangle, then carefully into a series of increasingly thicker horizontal strips, before he dips the scarf into an icy stream. Finally, he puts the cold sodden material against my forehead and ties the ends snugly. It is a crown of coolness, intensely refreshing. The scarf my brother has always worn now is mine to keep. He showed me all the steps for folding a bandana just as he’d taught me how to make a peanut butter and jelly sandwich or a paper bookcover out of a grocery bag. From the stream, I walk on surrounded by light-dappled trees, my limbs lank and swinging as I jump from a stone, landing on rotting logs and leaves. I stretch my arms, an insect-sized creature among giants, free to run, my red headband a badge of independence and belonging. Decades have passed. Again, I find myself among redwoods, this time reclined on the ground. I start my sentence with “I”. It is a figure of speech. I am no longer I. I am not the person I was. I cannot read or write. I cannot remember the color of the rental car I’ve been riding in for weeks. Most days I cannot stand upright without help. When asked what I like or what I do, I can’t answer. Yet I, this person I seem to be, still is here somehow, remembering walking in a forest in another body, another life. “If I am not I, who am I, then?” I asked Pilar, the wisest person I know. Trained as a midwife and manual therapist, Pilar gives treatments in a room built around a standing redwood tree. The clinic where she works is called The Healing Tree. “You are the one who has witnessed all that has happened to you,” Pilar says. One night, in Montreal, when the pain was too extreme, when I felt I could not continue, I called at home a counselor, a psychiatric nurse who talked with me, sharing her own stories of growing up in a patriarchal family, one of ten siblings, in the days before the Quiet Revolution. She had met with me every week for over a year before taking her retirement. I was not well enough that night to leave my apartment, so she came to see me for a final visit. “Who am I,” I asked, “if I have lost my career and family?” “We are not just our jobs and families,” she said. “Tu es aussi Eve du cosm/os".” You are also a part of the cosmos. The Cartesian schema for what it means to be human seems even more ludicrous from the vantage point of a forest floor: the idea that nature is outside us and that inside us is pure thought, ethereal intellect. Descartes saw consciousness as predicated on reason alone: I think, therefore I am. Yet thinking ourselves into being is a superhuman feat. Hard mental labor is required to construct, figment by imaginary figment, a fiction of ourselves as separate from nature and superior to all other creatures. It requires toiling in the footsteps of all those who have willfully mistranslated the Bible to read that human beings have “dominion” over the rest of creation, standing above and outside it, as if we were not made of the same substance as sand and stars and animals and plants, cousins not only of apes but also of lizards and dandelions. The word “heal,” going back to its Anglo-Saxon and Germanic roots, means to make whole. The same connection between healing and wholeness is found in civil law, which puts the onus on the injurer to make the injured party whole. It is there, too, in the language of the Bible, spirituals from black folk religion that sing of the medicinal plant grown east of the Jordan river. There is a balm in Gilead to make the wounded whole. Here in the forest, dusk approaching, I ask myself: What do you need in order to heal? Injury happens in an instant. Repercussions of my dental appointment took longer, days and months, to spread from the wounding of a single tooth nerve to damage throughout different systems, inflammation, increased cortisol levels, heightened blood pressure, muscle spasms from head to toe, alterations visible in tests of blood and blood pressure, a single stone throw to ripple through every tissue, every cell. If this body, this I, however we name it, is to heal, focus cannot be only on the site of injury. Even a root canal procedure did not end the electric pains, incessant throbbing I felt in the injured tooth. Nor can the focus be only on symptoms, as if stopping unpleasant sensations at any cost is the answer. I didn’t know what to do. A friend advised me, “Do whatever the doctors tell you to do.” A long track record of failed medical interventions followed from my bending to that dictum, even when I feared certain treatments and medications would do more harm than good. For Virginia Woolf, being recumbent is the epitome of illness. She observes that a person who falls ill is perceived, before all else, as in need of a bed. Patients cannot be upright. It is incumbent on them to be supine or prone. From that change of bodily posture, a new orientation and identity emerges. In a horizontal position, “we cease to be soldiers in the army of the upright … they march to battle. We float with the sticks on the stream.”1 Woolf notes the wisdom to be gained from such a shift, the granting of a new viewpoint, a position that allows one to look up at the sky, time and perspective to watch the clouds change shapes over an hour or a day. Forced to lie down by the weight of my seemingly hundred-pound head, I see wholeness also in walking upright. I understand why injured horses will never stop trying to right themselves, even using their heads to support their body weight if their legs will not. My wish is not to join the ranks of conformity, Woolf”s army of the upright marching with the crowd, unappreciative and unaware. Instead, it is to savor kinetically what I first noticed when, like Woolf, I was a floating stick on the stream, to take in up close and with my senses intact landscapes I observed from below. I yearn to do so again, but now with a view of the horizon, the mobility to look right or left, up or down, to set off and explore, arms and torso and legs swinging freely, earth resonant under each step. This morning’s lidocaine infusion jolted me back to a temporary state of normality. The pain around the circumference of my skull melted away; with that pressure lifted, all was restored: clear vision (I can see without straining; objects and letters have defined outlines), sharp hearing (I can hear low sounds, distinguish individual voices, turn up the volume on the radio without recoiling in pain), normal appetite (I feel hunger; my mouth no longer has a bitter metallic taste), normal thirst (I feel that my throat is dry; I drink, my thirst is quenched), verticality (I can stand upright and support my head without special effort) and lucid thinking (I can listen and comprehend as the doctor explains research studies about the brain). Before the lidocaine infusion, I had struggled to reply to a doctor’s simple question: “How are you?” Each word tripped me up, the “how,” the “are” and the “you.” How was I? I didn’t know. Now I answer, OK. Still my hope is tempered; this normality is temporary. Most likely, it will last only a few hours. I will be having a series of lidocaine infusions, twice a week for seven weeks, the longest I can be away from Montreal. If healing means to make whole, I need now to do something: eat a piece of fruit, walk across a field, crochet a scarf, dance to music, breathe deeply. Even lying down, I can move my arms and legs, extend and flex my spine and head. Taking action engages, stimulates in concert, wires discrete parts, tissues and physiological systems, central nervous system and periphery. Within the constraints of my injury, the more that I nonetheless act, the more I integrate these different components, and the greater the chance of this temporary reboot lasting. My surroundings, I think, imprint this dynamic more profoundly: the knitting together of stimuli and responses for a functional purpose, a walk in the forest. Imagine resetting the nervous system as a process like learning to ride a bike: turning the pedals with my feet, going through the motions repeatedly, over and over in search of balance, the wheels of the bike spinning, until one day, in a flash, I have my equilibrium and ride away, no training wheels needed, powered by my own resources. Here each step on sodden redwood and fir tree needles, each touch of the underside of a fern frond rough with brown spores, each breath of air infused with mud and laurel and animal smells, recalls me to inhabit my body once more. There is no veil between me and the world. And if tonight or tomorrow, I regress? The coast redwoods stand around me. They answer with their mass, their towering presence, their ancient claim. The internal capacity to turn a charred root socket, charcoal remains of a past inferno, into a stand of enormous trunks and green branches, a grove of giant trees spaced geometrically in a circle. For all their immensity, redwoods have a strangely shallow hold on the earth. The coast redwoods of Muir Woods and giant sequoias further inland alike have no taproot to anchor their gigantic weight, as much as two million pounds for a three-thousand-year-old giant sequoia. For both kinds of redwood, solidity rests on the breadth, not depth, of the fibrous latticework bracing them from below, each tree’s roots joined to those of adjacent redwoods, both a system of irrigation and a structural foundation. To heal, let go the question, what does it mean? Ask instead: to heal, what is to be done? For now, my answer is: lie here, take in this humming abundance of stillness, nourishment palpable in each groove of bark corrugated to catch rain, endurance of ancient cycles that continue now. On other days, you’ll need to plumb your last reserves of strength, to walk, step, touch, reach, even--down the road--run, leap, read the history books in the park store, talk to the other visitors and to the park rangers, write about what you see and recall. But now, at dusk, just hear what the resonances of time have to say: even sequioas three hundred and fifty feet tall keep their footing by clasping shallow roots to the broader mass of all the roots of their neighbors intertwined. Sometimes the only way to be vertical is to tap into what is unseen, what is under our feet. 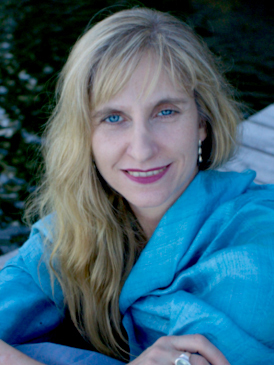 Eve Rachele Sanders is a writer living in Montreal. A recipient of a Mellon Fellowship in the Humanities and a National Endowment for the Humanities Grant, among other awards and grants, she received her Ph.D. in English from UC Berkeley and is the author of Gender and Literacy on Stage in Early Modern England. Currently, she is writing a memoir about the experience of being a literacy scholar who lost and regained the ability to read and write.